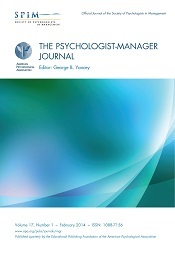 My paper, “Coaching Psychology and Positive Psychology in Work and Organizational Psychology” is published in THE PSYCHOLOGIST-MANAGER JOURNAL (a scholarly publication sponsored by the Society of Psychologists in Management - SPIM): Vol. 21, No. 2, 2018. Pp. 130-150. This article deals with the contribution of Positive Psychology to Coaching Psychology in the organizational contexts. First, the current situation of coaching in the world of work is outlined. Many are the “savage” applications of so-called “coaching” in the organizations: The chaos that reigns in this field is stigmatized. It is therefore necessary to identify the “psychological” Coaching to define in a serious way the scientific–professional field. Positive Psychology could offer to Coaching Psychology an interesting perspective, but at the same time, we have to avoid trivializing. Seeing only the “positive” aspects of organizational situations of the people at work—as if there were no hardships, sufferings, and serious problems in their organizational life—could drastically reduce the effectiveness of Coaching. Pros and cons of Positive Psychology applied to Coaching are then outlined.